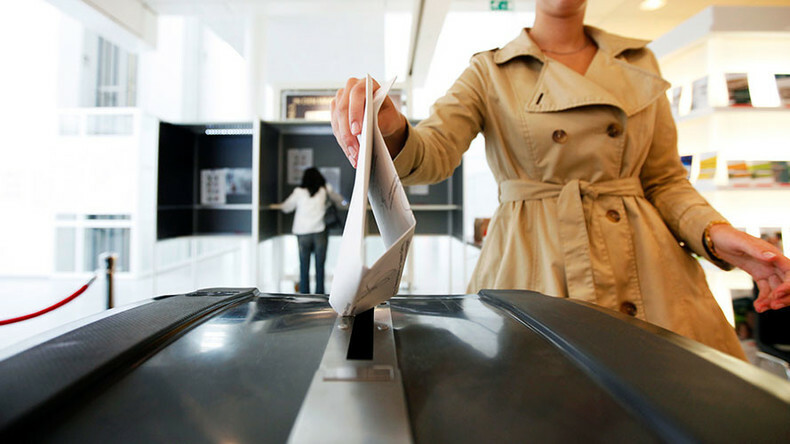 Up to 13 million Dutch voters are heading to the polls on Wednesday to elect 150 members of the lower house of parliament in a symbolic Euroscepticism showdown that seems to have split society along the immigration policy divide. Some 28 parties are competing in the election which is largely viewed as a face-off between ultranationalist Geert Wilders and the current Prime Minister Mark Rutte. Under the proportional representation system, any party who receives more than 0.67 percent of the vote, will pass the mandated threshold and get at least one seat. Following the latest round of televised debates on Tuesday night in which representatives of 13 parties competed, Prime Minister Rutte’s People's Party for Freedom and Democracy (VVD) is leading Wilder’s Party for Freedom (PVV) by a small margin. The Dutch Peilingwijzer website which tracks down six polling outlets says that VVD will likely gain between 24-28 seats, versus 19-22 that will most likely go to PVV. The Christian Democratic Appeal Party (CDA) and its leader Sybrand Buma are predicted to gain between 19-21 seats. PVV op 24 bij De Hond. At least four other parties are likely to gain more than 10 seats. These include the centrist D66, Green-Left, the Socialist Party and the social democrat Labour Party (PvdA). Whichever party can secure the majority 76 seats in parliament, either on its own or through a coalition, will form the new Dutch government and choose the Prime Minister. Rutte who took on Wilders in a heated debate on Monday night has made it clear that his party will not work with the PVV leader. “Not even in a tolerance structure – no, never, no,” Rutte said, dismissing the possibility of forming a coalition with Wilders. Rutte is urging voters to back him so that he continue his political course and focus on preserving the Dutch economic recovery and its place in the European Union. Wilders remains hopeful that he will be able to persuade voters to side with the global anti-establishment trend reinvigorated by the Brexit referendum and the victory of Donald Trump in the US. He told reporters on Wednesday that the "major issues" are for Dutch people to decide "their own destiny, the sovereignty of their own country, spending their own money, making their own decisions about immigration..."
Wilders has said that Netherlands’ exit from the European Union would be “the best thing that could happen to us." Rutte instead argued that the so-called Nexit would cost 1.5 million jobs and create “chaos”. Wilders, on the other hand, told the voters that after a Nexit, the Dutch would become the “master of our own country again." As part of his controversial agenda, the 53-year old Wilders wants to close Islamic schools and asylum centers. In addition, Wilders wants to shut down borders with a blanket ban on migrants from Muslim countries. The ultra-conservative also wants the Koran to be banned in the Netherlands. 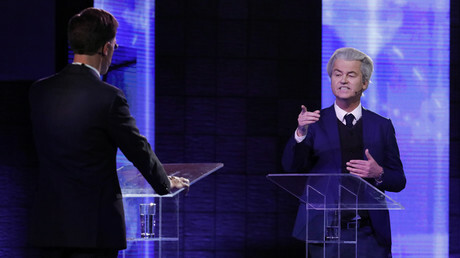 During the final debate, Wilders engaged in an intense face-off with PvdA party leader Lodewijk Asscher over the issue of immigration. The issue and debate around foreigners in the Netherlands has heightened in recent days following the diplomatic row and weekend rioting over the barring of the Turkish family minister from entering the Turkish Consulate in Rotterdam. When asked by RT whether anyone should be afraid of his potential victory, Wilders said that "nobody should be afraid, everybody should be happy..."
"...But the elite in Brussels might think twice [about] opening a bottle of champagne if we have a good result today." Some of Wilder's supporters told RT ahead of the election that the Party for Freedom is shaping the new political agenda for the Netherlands. “Wilders is a person who notices the frustration, what is brewing and annoying people and he expresses it. Other parties are now listening as well,” Wim Keizer a local politician in Volendam told RT. While the PVV's support is strong, Wilders is unlikely to be able to form the next government even if he wins the popular vote, as all mainstream parties have ruled out working with him.